Bloom: Once blooming, Striking, semi-double 3-4″ blooms (petals 12-18) with crimson background splashed and striped white and pink, set off by bright golden stamens. Blooms cover the once blooming, nearly thorn-less, compact, spreading well, foliaged bush. Interesting Facts: One of the most famous of all old garden roses. 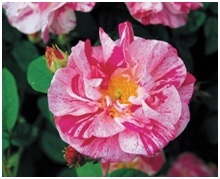 ‘Rosa Mundi’ was named after Fair Rosamund, the mistress of King Henry II of England. Produces nice hips in the fall for the birds to enjoy and is also shade tolerant; perfect for that dapple sun area.